Call Eileen (831) 277-9939 To see an Oaks Condo or other condo! Updated, cozy and charming street level, one bedroom end unit with renovated kitchen that includes new granite countertop and island with sink. Patio off the kitchen/dining area. Appliances include refrigerator, gas stove, microwave and brand new washer/dryer. Square Footage: 696 sq. ft. Cute condo with stunning views of the mountains from the front deck. Remodeled kitchen and bath in 2016. Kitchen features granite countertops, stainless steel appliances, and new cabinets. Bath features new cabinets, large walk-in shower and granite countertops. Living room with high ceilings and fireplace. Hardwood floors throughout living room and bedroom. Tile floors in kitchen and bath. Square Footage: 1050 sq. ft. Spacious, bright corner unit with wonderful mountain views. Sleek, warm interior. cozy fireplace, large deck in a stellar location with close proximity to pristine beaches, nature, fine dining, wine tasting. It location offers ideal temperature and privacy with with no adjacent units. 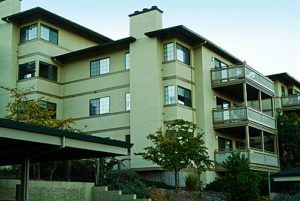 Serene mountain views from almost every at one of the most sought after condo complexes on the Monterey Peninsula. This corner unit offers lots of light and living space, fireplace and a private balcony. Centrally located, just minutes to the beach. Amenities include clubhouse, outdoor sport court and spa/pool. Prime location, Overlooks community pool. Interior remodeled with granite countertops, travertine tile, laminate wood flooring, market fireplace, views and private deck. Square Footage: 1066 sq. ft. Wonderful Penthouse unit is light and bright with mountain views out to the former Fort Ord. Cozy fireplace with slider out to large private deck. Large master suite with bathroom, Second bedroom has private entrance to guest bathroom. Washer/dryer. Although in original condition most appliances are newer and well cared for and waiting your personal touch. Convenient location to beach, shopping airport, restaurants and entertainment. One of the Monterey Peninsula’s best kept secrets.